Here it is...the July 2009 edition of Daily Inspirations...download it now for FREE here and start scrapping!! Entries are due by the 5th of the following month. July entries are due August 5th. 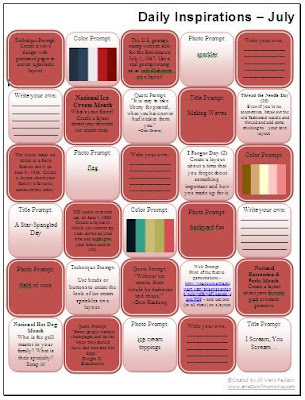 Download the FREE JULY 2009 DAILY INSPIRATIONS now and start scrapping!! 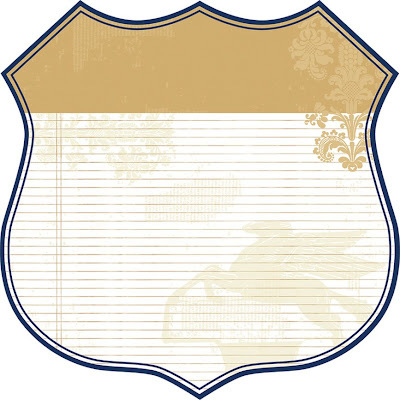 It's not too late for your chance to be inspired and win the June 2009 Daily Inspirations prize! Layouts can be submitted until Sunday, July 5th, 11:59 PM (CST) for a chance to win! 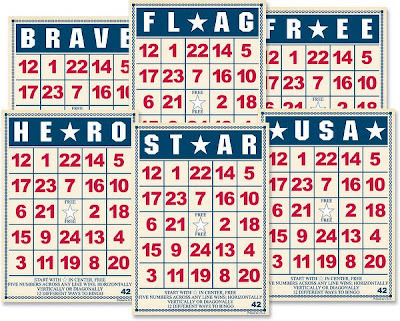 The summer might be flying by like a shooting star, but at least we have some great products to scrap our Independence Day festivities. 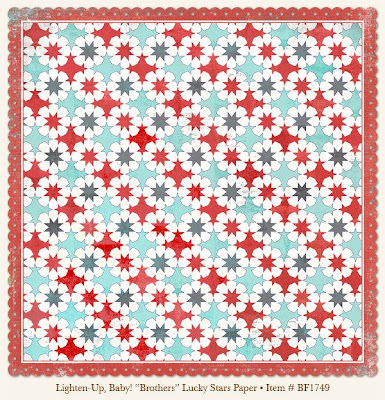 This particular sheet of patterned paper might be meant for a boyish theme, but the colors and festive design are perfect for a more patriotic theme! I recently realized that I've been forgetting an important sector of scrapbookers in my FIVE FAVES posts - digi scrappers. I promise...I won't let it happen again. 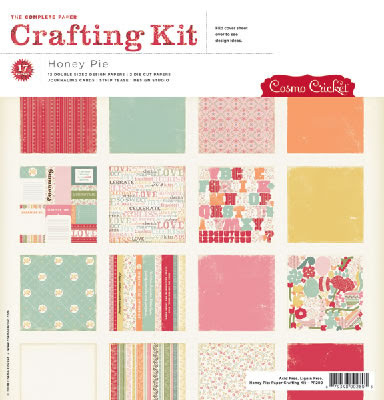 So, how about this great kit by Holly Brooke Jones to record your memories on your computer! I've envisioning five of my favorites fireworks from this years show peeking through the openings of this negative strip! 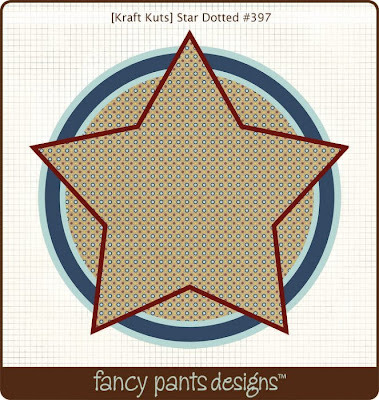 Fancy Pants didn't forget this super summer holiday in their new line of kraft patterned papers. This decorative edged sheet is the perfect background for a few of your favorite holiday pics. What new products will you be scrapping your festivities with? Summer is most definitely here...we went from chilly to HOT, HOT, HOT in less than a week! Kaitlin is loving her pool time though as her daycare takes them nearly every day now that the weather has heated up and I can't believe the tan she's already got going in just a handful of afternoons! She's always been one to tan easily and has yet to ever really burn. I'm totally jealous, by the way. 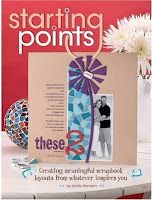 You've got 12 crafty days left to submit your entries for the June Daily Inspirations challenge...and earn your chance to win this month's awesome prize - your very own copy of Linda Harrison's Starting Points: Creating Meaningful Scrapbook Layouts From Whatever Inspires You. If you missed the initial June Daily Inspiration post, download them now for FREE here and start scrapping!! All the details for submission are included with the download. Layouts will be accepted until Sunday, June 5th, 11:59 p.m. and the lucky winner will be announced within a few days following the deadline. "He didn't tell me how to live; he lived, and let me watch him do it." "There's something like a line of gold thread running through a man's words when he talks to his daughter, and gradually over the years it gets to be long enough for you to pick up in your hands and weave into a cloth that feels like love itself." We're off to celebrate Czech Days in Tabor today...I'm sure I'll be sharing pictures and more here soon, but if you'd like to know more about my little hometown's annual celebration, you can read more about it here. In honor of Czech Days, I thought I'd share one of the layouts that I created with photos from last year's celebration. Personally, I'm not much of a mini album maker. Not because I don't like them, but because I have very limited time to spend on my craft and I tend to spend what little time I have creating standard 12x12 layouts. 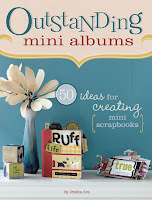 However, after reading the book that I'm about to share a bit of information with you about - Outstanding Mini Albums: 50 Ideas For Creating Mini Scrapbooks by Jessica Acs - I am thinking that I must carve some time into my creative schedule to try my had at this facet of scrapbooking. Before Jessica gets underway describing the different types of mini albums, she starts of with a 'Before You Begin' section that outlines some very helpful tools that you might want to consider if you want to pursue some of the albums highlighted in this book. Do to the binding and scoring often necessary when creating mini albums, there are some tools that you may not already have in a standard scrapbooking stash. This chapter showcases 9 albums and discusses the use of pre-made mini albums and how to make them your own through creative embellishing techniques. Jessica points out that using a pre-made album can certainly speed up the process of creating a mini-album, but it certainly does not have the limit the level of creativity. This chapter showcases 10 albums and shows us how to create a unique mini album completely from scratch!! Not only are these types of albums cost effective, but there are also NO LIMITS on size, shape or material. This chapter showcases 14 albums and focuses on how to make mini albums out of everyday items - trash to treasure, so to speak. There are examples of albums made of everything from restaurant drink coasters to paper bags. 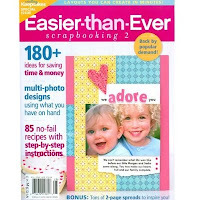 This chapter showcases 9 albums and is perfect for the crafter who loves to use their creative talents for making gifts. Who doesn't love a handmade gift? This chapter has mini album ideas for everyone you might have on your gift-giving list which can be adapted for a multitude of holidays and/or occasions. 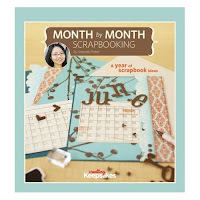 Now, in working with Jessica at WeScrap (she is one of the founding members and I was an Inspiration Team member there last year), I knew that she loved mini albums, but I guess I didn't realize quite how much! One of the first things I realized in going through this book was that nearly every mini album was created by Jessica herself and they variety in style and technique was just AMAZING!! She did bring in a few other talented artists to share their mini album creations as well including Andrea Deer, Mou Saha, Brenda Neuberger, Carolyn Lontin, Michelle Van Etten, Cami Bauman, Kathie Daub, and Julie Overby. One thing that I really loved (and appreciated) about this book was that each featured album in chapters 2-4 came with a complete material list, step-by-step instructions on how to create the album in words and photos as well as a photo of the finished product. Some even included cutting and scoring guides! These features make even the most complicated looking album an fun and easy task for the novice and expert mini album maker alike. There are also several templates at that back of the book that can be used in your mini album making. Also in the book are 5 amazing step-by-step techniques for making your mini album even more unique and 4 bullet-point lists on the following topics: Embellishment Alternatives, Mini Album Theme Ideas, Displaying & Storing Mini Albums and Mini Album Gifts. All feature some great tips and ideas! Again, whether your a novice or pro at mini album making, this book is sure to have some album ideas that you'll love and make you want to get in your mini album mode right away! Visit the Outstanding Mini Albums page at Amazon.com. You can also read more of my reviews for other recommendations. Check back for this review soon and your chance to win a free copy!! Are you lucky enough to be vacationing anywhere exciting this summer? If so, record your journey with a few of these great travel-themed products! 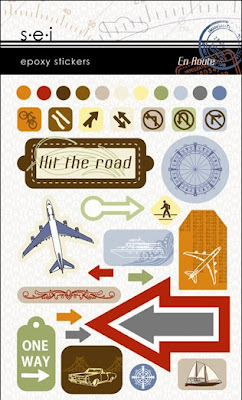 I love the sheen of epoxy stickers and these great travel images and symbols would be the perfect addition to any vacation layout! This is just one part of the amazing SEI En Route collection. 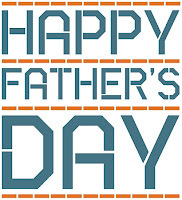 Be sure to check out the rest by following the link. 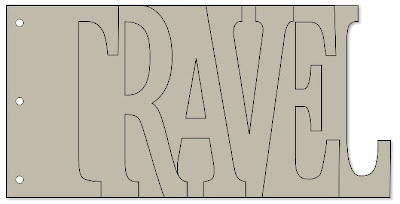 Who doesn't love chipboard...you can leave these naked chipboard pieces as is or customize them any way you like to fit the theme of your destination! Bamboo?? Really?? 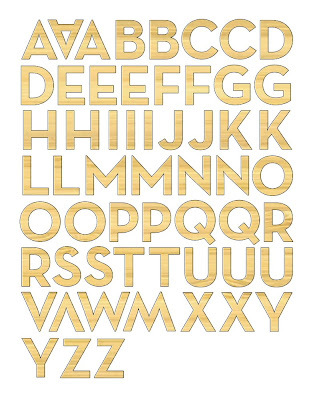 Not only will these amazing letter stickers from the new Making Memories Great Escape collection add some wonderful texture to your page, but may also add context. Hawaii, anyone? 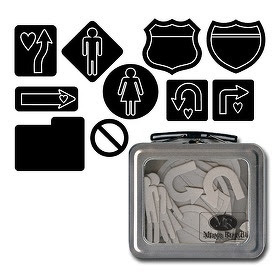 This road-sign shaped patterned paper could be the perfect backdrop to highlight your summer road trip! The LYB Traveler collection is HUGE!! 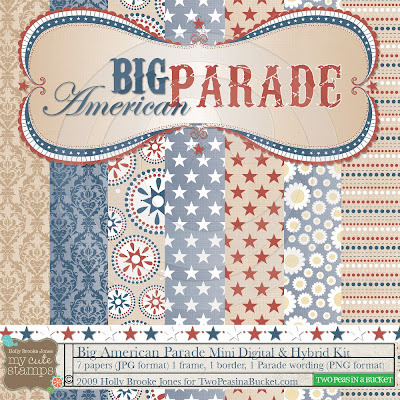 Of course it has an assortment of patterned papers (including a set of matching cardstock), but it also has about every coordinating embellishment you can imagine! Need a place to house your favorite vacation photos? Here's the perfect mini-album to make them shine! What are your favorite travel-themed products currently on the market. "Life is made of moments, small pieces of silver amidst long stretches of tedium. It would be wonderful if they came to us unsummoned, but particularly in lives as busy as the ones most of us lead now, that won't happen. We have to teach ourselves now to live, really live... to love the journey, not the destination." Kaitlin knew our annual backyard grill out to celebrate with family wasn't going to be until Saturday. Since her birthday was actually last Tuesday, she kept asking if we could 'have a party with just the three of us' to celebrate on her actual birthday. We kept playing it off with 'we'll see' like it was no big deal. but really her dad and I had plans all along. This is a HUGE treat as we almost NEVER go to the theatre to see a movie. Even when we got to the movie theatre, she didn't get it right away that we were actually going to see a movie there! We saw Night at the Museum: Battle of the Smithsonian. It was just as good as the first one...love that Ben Stiller! Kaitlin thought it was pretty cool, too. Afterwards we went for a little stroll at the local duck pond and Kaitlin fed the rest of her popcorn to the ducks. It was getting a little too dark for pictures, though. ...and family and neighborhood friends come and hang out with us for awhile. Usually the sprinklers come out, but it was just a bit on the cool side for sprinklers this time. However, we were simply pleased that it didn't rain that day as it had just about every single day for a week leading up to Saturday (it's rained every day since also...). ...but then we brought out the 'real' cake and there was more than enough for everyone. These are pictures from when my hubby took Kaitlin to her first softball clinic this spring. It was right after I broke my leg, so I didn't get to go along.